Philippine weather forecast said, "Tropical Storm (Bagyong) "IGME" was estimated based on satellite and surface data at 300 km East Southeast of Aparri, Cagaya". Bagyong Igme continues to intensify as it remains almost stationary, according to PAGASA. PAGASA said in it's weather bulletin as of 6 a.m. today, "At 6:00 a.m. today, 20 August 2012, the center of Tropical Storm "IGME" was estimated based on satellite and surface data at 300 km East Southeast of Aparri, Cagayan (17.9°N 124.7°E)." 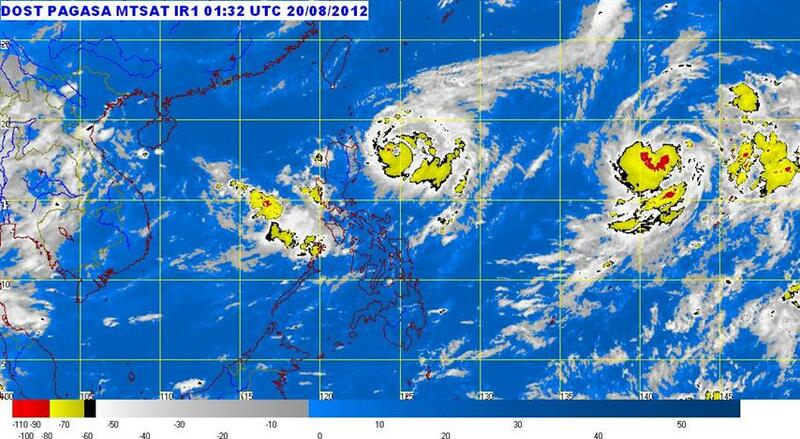 PAGASA raised storm warning signal no. 1 to Isabela and Cagayan provinces. Tropical Storm "IGME" is expected to enhance the Southwest Monsoon that will bring light to moderate rains over rest of Northern Luzon ( particularly Benguet, Baguio, Pangasinan, La Union, IIocos Provinces) Central and Southern Luzon especially over the western section, according to PAGASA. So to everyone's safety against cough and flu, please do bring your umbrella or any thing that can prevent you being wet from rains. Thanks for reading, you may share this weather forecast to your friends via Facebook, Twitter and Google+ so they may also be warned. God bless to everyone. Comments or suggestions about "'Igme' intensified into Tropical Storm August 20, 2012" is important to us, you may share it by using the comment box below.